The 2011 Ronstan A-Class Catamaran World Championship in Aarhus is just getting underway; Saturday and Sunday saw measurement of the 100 cats and first practices taking place in advance of the five days of World Championship races, with the finals being raced on Friday 19 August. For the first time in many years due, reigning world champion Glenn Ashby from Australia is not present to defend his title. The shift to catamarans in the Americas' Cup has prompted several AC teams to take on A-Cat sailors, and an overlap between the A-Cat Worlds and the first AC45 races in the America's Cup Series has resulted in Glenn and others having to pull out of the A-Cat Worlds. In the last two World Championships the silver medal went to Steve Brewin (AUS) and he is also the favourite at this year's event. But the calibre of the Australian line-up is high across the board and other members such as Jack Benson, Andrew Landenberger and Brad Collett will undoubtedly make an impression and will absolutely be in the running. The US, too, has its best sailors at the World Championship and it will be very interesting to see how they perform. The winner of the World Championship in 2007 was Glenn Ashby, but second and third places went to the US, and stars such as Matt Struble (also three time World Champion in DN Ice Boat.) and Lars Guck will be pushing to take the title to the US, hosts for the World Championship in 2012. In recent years, competitions in Europe have been dominated by reigning European Champion Bob Baier (GER), closely followed by Manuel Calavia (ESP), and they must be seen as having the best chances among European sailors. But Chris Fields (GBR) and Sjoerd Hoekstra (NED) also perform well and are likely to figure near the top of the results table. It will also be fascinating to see how the wild card sailors from other classes manage in the field. Dutch Mischa Heemskerk, who has just won silver in the Formula 18 World Championship, is warming up with Extreme 40 races at Cowes and is without doubt a very able competitor, as is the Italian Olympic sailor Francesco Marcolini. There are also new developments on offer this year. Since 2009, the development of curved daggerboards has really taken off and other components and sailing techniques have made parallel advances. Over the last year, sails have become deeper and masts softer. This means the sail can still be pulled flat when tacking, but when running before the wind it gives more power. Consequently, less wind is needed to sail 'wild thing' (run before the wind on a single hull), and wild thing on the trapeze has become a new technique which sailors must master if they are to have a hope of a top position. Designer Martin Fischer, who is renowned for various successful catamaran designs including the F18-Class, has produced a new A-Cat which will have its début in Aarhus. The boat is of a radical new design with an S-shaped leeboard and L-shaped rudder, and the name MayFly hints at the inspiration behind it. It has not yet been possible to make a flying catamaran that can compete on a traditional sailing course, but MayFly is an attempt to produce a cat which can sail in a traditional way when tacking and be semi-flying when running before the wind. Many adjustment permutations are possible for rudder and leeboard and it will be very interesting to see if the concept holds good and whether it is possible to master its intricacies before the World Championship races begin on Tuesday. 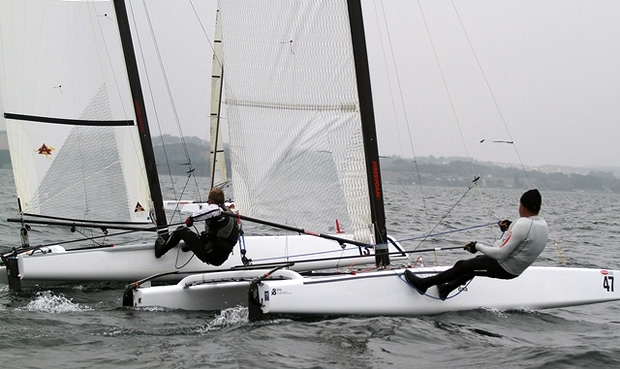 The 2011 Ronstan A-Class Catamaran World Championship is organised by Sailing Aarhus in association with Kaløvig Bådelaug. The event is supported by the City of Aarhus and Sport Event Denmark and is sponsored by Ronstan, Volvo and Henri Lloyd.